Jazz is one of my favourite kinds of music, both for listening to and playing, although I don’t often get opportunities to play it these days. Therefore, I was delighted to be offered a jazz gig (as a bass player) this coming Saturday night. This evening I met the rest of the band (for the first time) for a practice, which went pretty well. There won’t be any further practices before the gig. The band – The Jazz Knights – is newly formed for this occasion and (apart from me) is made up of members of Holyhead Jazz Club. It is currently a six-piece band, with a line up of tenor sax/clarinet (doubling), soprano sax, trombone, guitar, drums and bass. The programme for our concert on Saturday says: “Our music ranges from Traditional [jazz], through Swing, Bossa Nova and Tin Pan Alley/Show tunes”, which seems to me to be a fair description. The plan seems to be to keep going after this gig and maybe try to get a regular residency (perhaps once per fortnight) at a local pub. Hopefully I’ll get to be a part of all that too. We have a set list of 22 pieces for this particular gig. I have probably played about 7 or 8 of them before (including a few that I’m very familiar with, like Summertime, Satin Doll and Autumn Leaves) and I was at least vaguely familiar with about half the others. Amongst the tunes that are entirely new to me is a bossa nova piece called Wave (by Antonio Carlos Jobim), which I particularly enjoyed playing this evening. We didn’t have time to play through the whole set at our practice, so there will be a few that I’m sightreading on the night (which is just the way I like it). To make matters even more exciting, I am playing this gig on a borrowed bass ukulele. 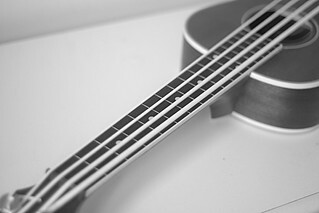 This is a small instrument (roughly the size of a viola) with polyurethane strings, which plays at the same pitch (and in the same tuning) as a bass guitar or upright bass. When amplified, it sounds remarkably like an upright bass but is significantly more portable (and easier to fit in small bungalows or on cramped stages). The only downside is that the scale length is very short (certainly compared to most bass instruments) and therefore it takes some getting used to the different finger spacing. It’s probably just as well that it’s a fretted instrument I’m borrowing! The gig on Saturday is a charity gig on behalf of the Anglesey Centre of Mission. It takes place at St Anne’s Hall, Dale Street, Menai Bridge, starting at 7:30pm (and going on until about 10pm). Tickets cost £6 and should be available on the door, although it’s a fairly small hall so space is limited. The Jazz Knights will be playing most of the music but there will be an interlude with music from a quartet drawn from the Menai Bridge Brass Band (as it happens both Tim, our trombone player, and I also play with the Menai Bridge Band but we’re not in this quartet).